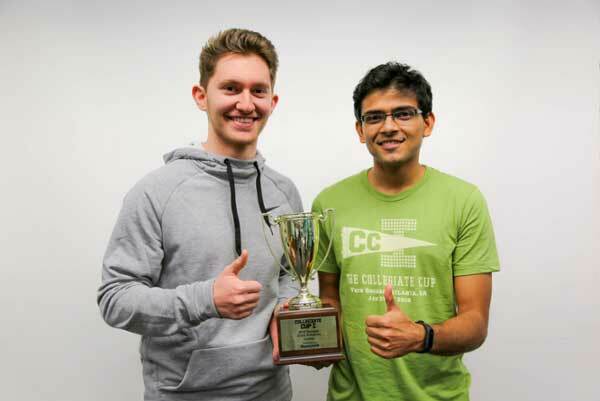 L-R: Michael Koohang and Deep Patel with the trophy they received for placing first in the Collegiate Cup coding competition. Photo by Hannah Hartman. Their web app, which they call “Spark,” took first place at the recent competition, held in Atlanta. They bested teams representing eight other University System of Georgia schools, including Georgia Tech and University of Georgia. Sandbox Communities, the collaboration platform for Georgia Tech’s Tech Square, hosted the first statewide collegiate competition January 25-27. The competition, organized in the categories of code, case study, and design, focused on improving the quality of life in Georgia. The Collegiate Cup, co-produced by HackGT, was open to student teams from any Georgia college or university. Teams were expected to generate actionable ideas to improve the quality of life for all Georgians by building on the state’s strengths. This year, the focus was to increase access to computational education for all communities across the state of Georgia. Koohang, 18, of Kathleen, is a Middle Georgia State (MGA) senior in the bachelor’s program in IT, with a concentration in software engineering. Patel, 21, of Dublin, graduated from MGA with the same degree in December 2017 and is now enrolled in the University’s master’s degree in IT. The two previously worked together on a ride-sharing app aimed specifically at college students. They decided to enter the Collegiate Cup after Koohang read about the competition in a newsletter. Besides MGA, the colleges and universities that sent teams were Agnes Scott College, Clayton State University, Georgia Tech, Georgia Southern University, Georgia State University, Kennesaw State University, University of Georgia, and University of North Georgia. “We were looking for another competition to enter and this seemed super interesting,” Koohang said. Patel had a special interest in wanting to create a platform that would help more students in Georgia get opportunities to learn computer science. The rural high school he attended did not offer computer science classes – not an uncommon situation in Georgia. “If I hadn’t been able to experience computer science through other avenues, I would not have known about the career options open to me,” he said. In brainstorming their idea during the 48 hours of the competition, Koohang and Patel decided building a platform that helped teachers learn computer science would ultimately have greater reach than trying to directly connect students to resources. When educators learn computer science they, in turn, can teach their students. Most schools have tech resources, but not all have educators with enough experience to teach computer science to their students. Educators who want to learn often look for resources online, only to be overwhelmed by the options and with no way to judge the quality of those choices. The Spark app is designed to connect educators with limited, if any, experience teaching computer science with those who have much more experience. The more experienced educators can serve as mentors and provide lesson plans and other resources to the novices via the platform. Koohang and Patel designed the app to create community, not just upload content, so teachers can identify more experienced computer science educators who live in their area, or at least not too far away. The two estimate they spent about 10 hours brainstorming the idea, then built the core functionality within 36 hours. Each team representing the nine schools competing in the coding category was given five minutes to explain and demo their idea before a panel of three judges. “Every presentation we saw was amazing,” Patel said. But it was Patel and Koohang who ended up with the first-place trophy – and a $750 prize. The experience was another reminder to them that coding is not simply a demonstration of skill.